A small subset of Original Medicare1 patients may require an ABN for Foundation Medicine® testing. 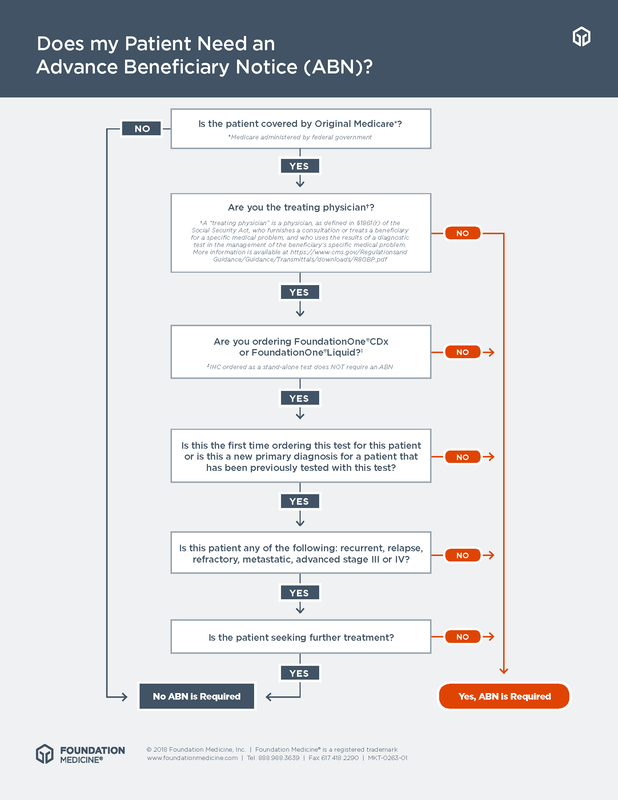 The decision tree below can help you determine whether you will need to send an ABN signed by your patient with your test order. Beginning on January 31, 2019, orders that require an ABN but are received without one will be held and not sent on for processing while we reach out to you for this required paperwork. Please note that a Test Requisition Form (TRF) that is missing clinical or insurance information—which is required to determine the need for an ABN—may also experience a hold. Therefore, it is critical that the TRF is complete. These requirements can be found on the CMS website, the Foundation Medicine test requisition form (TRF), TRF Explained, ABN Information, and Medicare Billing Guide. 1 Medicare administered by federal government.